Stems: rather stout, ascending or decumbent. Leaves: odd-pinnate; leaflets oval to linear-oblong, obtuse, fifteen to twenty-five, peduncles exceeding the leaves. Flowers: erect, in short dense spikes; tube of the calyx long-campanulate, twice as long as the setaceous teeth, sub-villous with partly black hairs; petals clawed; standard erect, ovate; wings oblong; keel obtuse. Fruit: pods erect, sessile, coriaceous. This is a common species of purple Vetch in the mountain regions. It has much foliage, composed of from fifteen to twenty-five tiny oblong leaflets borne on each of the leaf-stalks, which branch from the main stems. The flowers grow in dense roundish heads, and the little leaflets are rounded and entire at the apex. Each individual flower, like many of those of the Pea Family, is composed of five irregular petals, the large upper one, called the standard, being turned backwards when in full bloom, and the two side ones forming wings, while the two lower ones are united to form a kind of pouch, called the keel, which encloses the stamens and style. Astragalus adsurgcns from Oxytropis viscida (which it much resembles) is by observing two things. In the first place, the flower-stalks of the Astragalus branch out from all parts of the main stems of the plant, together with the leaf-stalks; whereas the flower-stalks of the Oxytropis are naked and grow directly up from the base of the plant. In the second place, the keel of the Astragalus flower is rounded, whereas that of the Oxytropis is very pointed. 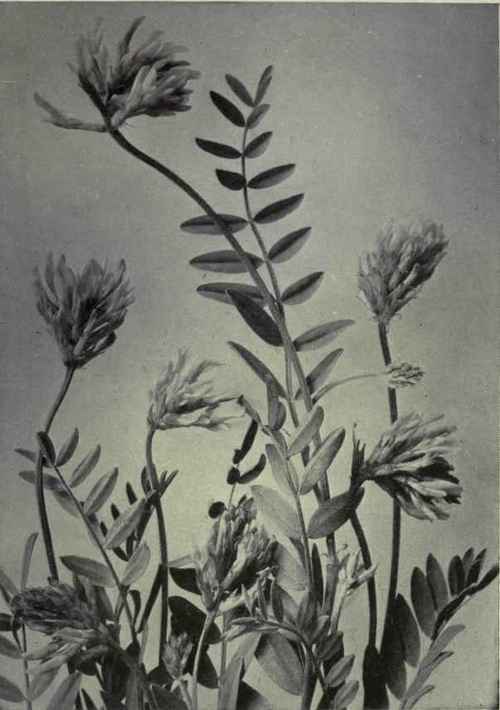 Astragalus hypo glottis, or Purple Milk Vetch, very closely resembles the preceding species, but may be distinguished from it by the fact that its leaflets are indented or notched at the tips, whereas those of the Ascending Milk Vetch are slightly rounded and perfectly entire. Astragalus alpinus, or Alpine Milk Vetch, is a dainty pale mauve species, with small loosely flowered heads and delicate foliage. It is frequently found at very high altitudes. 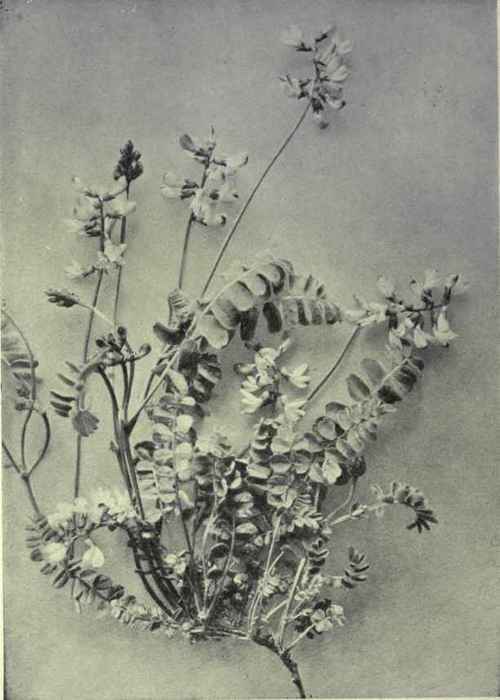 Astragalus Macounii, or Macoun's Milk Vetch, is a tall plant with sparse foliage and a few long loosely flowered heads of pale mauve, or white tinged and edged with mauve. The stems grow very erect and are quite slender. It usually is found in rocky places. Astragalus convallarius, or Slender Milk Vetch, is a lovely fragile species, quite unmistakable by reason of its very fine grass-like stems, tiny, narrow, silky leaflets, and little, scanty, pinkish-mauve blossoms, that grow far apart in long slender racemes, giving the plant a beautiful feathery appearance.